How to do i make like the number 15 out of a cluster of balloons? In addition to the comments below, please see my answer to a similar question about balloon numbers, including a short video showing some of the basics for creating numbers and letters with clusters of balloons. Big thanks to Sean O'Kelly from Australia who has offered to send his instruction sheet on how to make the frame for all numbers. If you are interested, please contact Sean via email at sean@balloondecor.com.au. My dad is turning 80 and would like to know how to make it. "want to make a 10 for my class reunion. what is the best thing to use. I was told pcp pipe." I am assuming that you plan to make a large, free standing number 10 sculpture, right? Then I would recommend to use either 1/2" aluminium rod or 1/2" conduit (PVC pipe). "What size balloons and how many balloons would be needed for a 6 foot tall number 1 balloon sculpture." I would suggest to use 9 inch balloons. The number 1 has a more rectangular shape, so it's fine to go with the slightly larger balloons. If you were making other numbers, like the number 5 or 6, it would be better to use 5 inch balloons. 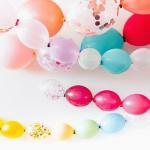 To estimate the number of balloons you can use the balloon arch formula. 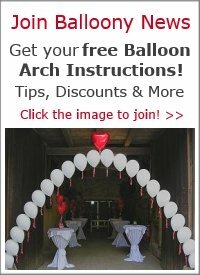 For a 4 cluster arch (or column) with 9 inch balloons you need 8 balloons per foot. When you calculate the number, don't forget to add the length of the base and the extension at the top to form the number 1. What size balloons and how many balloons would be needed for a 6 foot tall number 1 balloon sculpture. Including base and top of number 1? I'm using four-tone (pink, p polka dot, green, g polka dot)... I'm so confused right now lol. Please help thanks. My email to sean@balloondecor.com.au does not respond I really need the help and the info is there any help u can give me thanks. I've been trying to find number frames for months. How can I make them my self? I need numbers 5, 50, and 18. You need to get aluminium rod and bend it into the required shape. 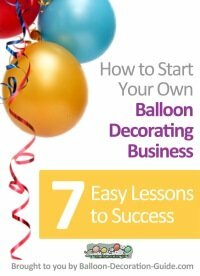 Please take a look at my answer to a similar question about making balloon numbers. What do I use to make the balloon numbers stand up? "how do I make a 50 I need it this weekend .. what do I have to use"
If that's not clear enough, you may want to contact Sean via his site (http://balloondecor.com.au/) and ask him to mail you his instructions. 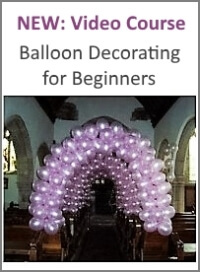 "Hi how much cost me a number 15 out of balloons"
Please browse through our Balloon Decorators Directory to find a balloon professional near you. Then you could contact them for a quote. There's another email address and a contact form at Sean's website, http://balloondecor.com.au/. Please try reaching him there. I tried to email sean@balloondecor.com.au for the balloon numbers and the email won't go through. Is there another way I could get it? Wow!!!! thank you so much!! You have helped me a great deal!!!! yaaaay!! Please help me with making a 15 and 16 out of balloons for a party. 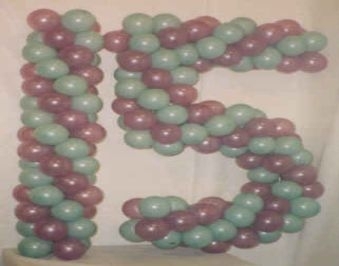 Also, large lettered 40" balloons, how to suspend them to make them look like they are floating? I have the sculptures for 70 from a party in the past. it had balloons on it. how do i recreate what i paid a fortune for with balloons? how do i make the number 25 with balloons...what materials are needed??? If you contact me privately with your email address I will forward you my instruction sheet on how to make the frame for all numbers.